Tusk Oversized Floating Typhoon Brake Rotor kits are made for increased performance and braking power for your motorcycle. Typhoon Oversized rotors are made from a special tempered stainless steel that is not only durable but will work with any type of brake pad. Brake rotors are precision laser cut to maximize brake pad surface contact. Full floating rotor design ensures optimal pad to rotor contact and even heat distribution for maximum braking force and smooth feel. Tusk Oversized Floating Typhoon Brake Rotor kits come complete with a billet aluminum caliper relocation bracket. Big difference from the stock rotor, installation is a breeze. I recommend all tusk products. Rotor kit eliminated the spongy oem brakes in my Yamaha. The Rotor looks to be a quality product and works really well in muddy enduro conditions. perfect fit, great easy way to increase stopping power on your bike. This is a great upgrade for the money. I ride with only one finger on the lever and just have to drag and blip it every once in a while to keep control of the front end. When I have to really brake hard, it modulates well and doesn’t do anything that catches me off guard. Yamaha upgraded to a large rotor in 17. Its what yamaha should have done. Hey guys, @dirkbike here. 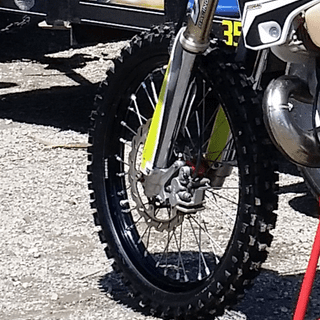 Have you been reading the KLR forums, trying to figure out how to get your front brake to work? Don't get sold by the eagle mike fan boys and spend hundreds on the SV caliper conversion and mods, it's not worth it. It would be interesting to see actual data regarding the increased stopping power, but I'd guess it's somewhere between 30-50%. It's night and day difference bolting this on. 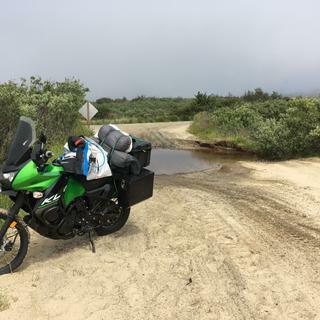 I've had to emergency brake in sudden dead stop freeway traffic, with a fully loaded KLR, to the point I was questioning if I was going to stop in time or dart off into the emergency lane and hope to god all works out- not a fun feeling or scenario to be in. I know with out a doubt, I would have darted off into the shoulder and gravel if not for this. It's one thing to pull off into the shoulder in a car, but another on a two wheeled machine that slips out under braking and gravel, which is typically what you find on the shoulder. 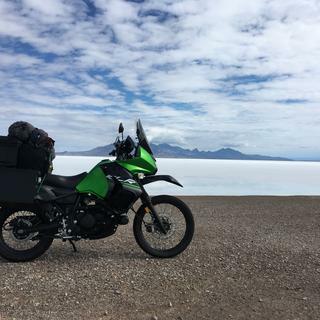 I would recommend this as one of the must have's on the KLR if you're more than just an occasional rider. 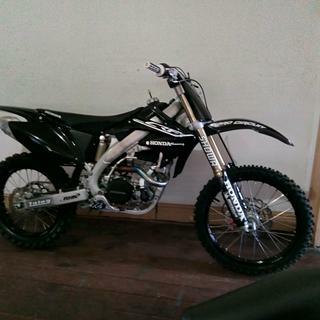 I bought the kit for a 2010 YZ250 since that is the bike the forks on 04 YZ250 are from. I really never had a complaint with the performance of my front brake but I felt I could get a little more out of it. This kit did just that. Much more stopping power without being grabby and still easy to modulate on steep downhills and into tight corners. All this for less than most name brand rotors. I am very pleased with fit, function and value of this Tusk oversized rotor kit. I have yet to have any issue a Tusk hard part. The only reason for 4 stars on durability is that I only have just over an hour on the parts. However, I see no reason why they should fail. Thanks RMATVMC for great parts, prices and customer service! The brakes on my KLR have always been mediocre at best. I installed the Tusk 320mm floating rotor which looks like a very nice piece. However, I didn't use the adapter to relocate the stock caliper, instead I ordered an adapter from Eagle Mike to mount a dual piston SV caliper. The result is amazing. All of the Tusk parts look to be of high quality. added this 2 weeks ago, big improvement on my 48,000 mile beater. price is great, braking is much improved. wither just being new vs the old rotor i cant say but its stops really well now. installation is easy, but you need to watch the video. its not intuitive how it works with the new bracket. but once you see and understand its easy to do. yes i would recommend it to someone in need of a new rotor or just looking for an improvement in braking. note, with new pads and new rotors it takes a while for them to bed in on the new perfectly smooth rotor surface. ride it 100 miles before you make a judgement.. 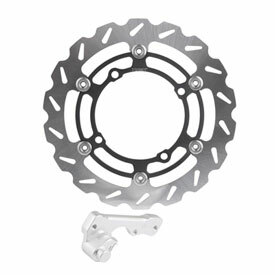 The 320mm rotor is what my KLR has needed all along. The brakes on the KLR are its weakest feature. The Tusk rotor makes a great improvement over stock. The machining and fitment are perfect. Great improvement on stopping especially for the price. Can't go wrong. 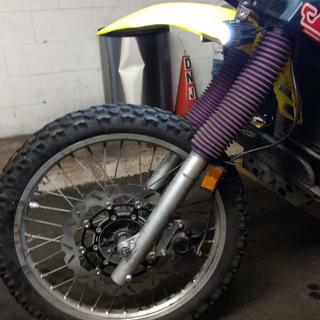 Installed on my 08 WR250F, fit perfectly and helps a lot with front brake power. It should have come this way from the factory. I'm very happy with my purchase and would recommend it. Good product for a fair price. If your stock stuff is bent might as well fit it with something better. Here you go. Amazing upgrade to get more stopping power out of your bike. Looks great also compared to the stock OEM rotor. Perfect rotor for my YZ 250. Really helped with my front brake on my YZ 250. OEM is little bit weak (although new models have 270mm standard). Works really good and price is just right. Fitment was 100%. Happy with it. Give this kit a shot with new pads and wear your gear when you do, the bike will stop quickly and feel solid. Get used to the little play in the floating rotor ever your solid rotor and it rocks. Tusk products are good quality at an affordable price. This is a nice rotor. I installed it on my restomoded 95 yz250. Much better feel and stopping power than the old stocker. I needed a little extra stopping power for a downhill corner @ Washougal & I got it. Installation was a snap, it looks & works good and hasn't given me a moments trouble. Great Piece, Fits well, Needs Instructions in the Box, can't wait to Test Ride once the Ice and Snow is Gone!!! This Brake Rotor and Caliper Bracket are well made, have great Fit and Finish but came without instructions in the box. I have a factory Shop Manual so I had no problem performing the installation. In the description of the item, note that new Rotor Retention Bolts are not included. Many folks have noted that the OEM Kawasaki Rotor Bolts are more like cheese than steel. Often replacement bolts are required. I purchased the Tusk Rotor Bolts but did not need them. To install the Caliper Bracket the OEM bracket has to be removed from the Caliper and replaced with the bracket in the kit. When one disassembles the old bracket the Pins upon which the Caliper slides require a dab of Silicone Grease. It would be helpful if a little envelope of Silicone Grease was included in the "kit", otherwise one has to purchase an entire tube of Silicone Grease. Great addition to my YZ. Rotor and hanger are a perfect fit and the quality of parts are as good as anything out there, for just slightly more than half the price. RMATV and the Tusk brand comes through again. Works just as good as the ultra expensive brands. Will continue to purchase in the future for all of my bikes. Didn't realise I had a bad breaks till i installed this! Wasn’t sure how this would work, but it’s great! A huge jump over stock. This setup is awesome. Perfect fit and my bike now stops really well. Easy install, big improvement in braking! Very happy. Priceless when it comes to stopping! 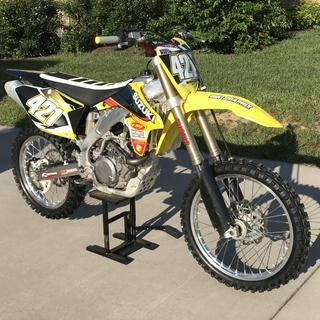 My yz was bone stock when I bought this and my floating front disc was ok. With the Tusk oversized front rotor you can stop on a dime in the dirt without going over the bars. It's a must even if you're a weekend warrior hitting the trails, you'll definitely notice the difference. It's definitely one of the first things you should do. Add to cart!!!! Another great product from Tusk without blowing the bank.. Thanks Rocky Mountain ATV/MC!!! Love it... amazing stopping power now and looks great too... thanks rmatv!!!! I race hard enduro and have really beaten up this rotor for the last 150 hours it has been on my bike. Brakes feel amazing and stopping power is scary! BUY THIS THING!!! It is a great product. Works great and is easy on the pocket book. I bought this for my YZ 250 it increased my stopping power incredibly. Plus the price is great.I would recommend this for anybody that needs some better braking on the front. Combined this with the Tusk Sintered Brake Pads to give my YZ250 a like new feel. Fitment is perfect and 1 finger braking is easy now. I had no issues installing this on my WR450f. Fitment was good and for the money you would be hard pressed to find something of equivalent performance. I am using this on my 80/20 street set of dual sport tires. I wouldnt want to run floating rotors in the mud but for what I use they are perfect. With upgraded pads the performance was exponential. Installed absurdly easily. Noticeable difference in stopping power over stock, with old Tusk brake pads. This rotor in combination with the steel braided brake lines has made a world of difference in stopping my KLR. I can now actually use two fingers on the brakes and expect to stop. Actually moving into two finger stoppie territory. Just don't grab a hand full of brake off-road before you're used to it. Your front will lock up quick. Bike stops easy and brakes have a good feel to them. My boyfriend wanted this for Christmas. He put it in less than a few weeks later and he couldn't be happier! Upgrade to an oversized rotor without breaking the bank for us average riders. Better stopping power with more surface area and pucker power. Can come into corners and turns harder and longer without worrying about slowing down enough. replaced the OEM rotor on my 04 Exc 450 with a new set of ebc pads. Very nice upgrade. great stopping power compared to the OEM. I do prefer the Galfer on my 13 Kx 450 but its also a little more money. Bang for the buck, you cant go wrong with this setup. Does this setup also include a space to mount the magnet for the speedo? BEST ANSWER: Hi Paul, Yes it does have a magnet mount that will house the stock speed-o magnet. I have an aftermarket speedometer by trailtech, and the magnet replaced one of the mounting bolts for the rotor. That didn't change, but the sensor that is nstalled on the caliper mount had to be improvised by myself, which basically involved figuring out where it needed to be located and drilling a hole in the new caliper mount. it has worked fine since I installed the rotor with no problems. From what I could see, the kit comes with a piece that basically pushes the caliper out further to compensate for the oversized rotor. If the speedo works on a factory bike, there should be no issues with mounting. I don't think it has that space for that adapter. At least on my Kx450. Perhaps on a diff model. Cheers. No the bracket only moves out caliper to fit larger rotor. There are no additional mounting holes. I saw nothing indicating accommodations for a speedo. This setup was used on a Mx bike. I use the neutron pads. I think more expensive pads work better but for the price these do well for me. The oversized rotor is one of the most important upgrades that I have done to my bike. I will have one on ever bike I own from no on. bought three kits for my son's 15 yz250f all three bikes still had the oem pads and the braking was greatly improved especially indoors. Stock size will fit. Always had good luck EBC pads. Is the replacement caliper mount drilled for the magnetic sensor for speedo/trip meter? BEST ANSWER: I can't say for sure, but I doubt it. I don't remember seeing it when I installed it. I hope this helps. With being an over sized rotor replacement part. In 2015 the YZF front rotor was 250mm, in 2016 Yamaha stepped up to 270mm, Would this part be a direct replacement for a 2016 270mm YZF rotor? You cannot data enter 2016 for the part match lookup. BEST ANSWER: This is a 270mm rotor so in theory it would be an OE replacement rotor on the 2016-2017 models, but for those years we have a standard rotor that is 270mm that doesn't come with the extension bracket. The primary difference between the 2 would be floating vs fixed. Is there a floating OE replacement rotor offered? As I see it the advantage for the kit with bracket is that you will get a floating rotor. For MX or SX the floating is preferred. BEST ANSWER: It depends on your rotor guard. It will only work with rotor guards made for oversize rotors. 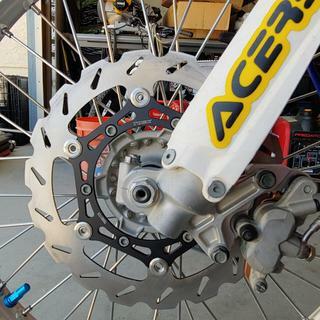 I also have the Acerbis X-brake disk cover and it is designed for up to 270mm rotors. I used to have the metal Devol disc guard which was only made for small rotors. BEST ANSWER: There is not a replacement rotor alone. 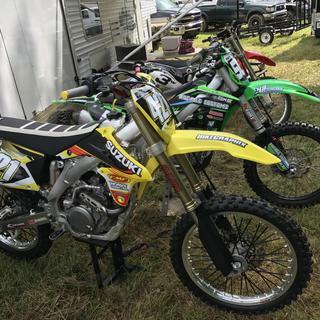 hi, i have a 03 kx250 and after looking at part numbers between the 06 and 03 everything is the same for the two so would this kit fit my 03 ? BEST ANSWER: No the 06 KX250 front rotor will not work on the 03 KX250. Unfortunately we do not carry a Tusk Oversized Front Rotor for the 03. What do i do if my bike dosnt come as an option for this product? BEST ANSWER: Then we do not offer it for that machine. i apologize for the inconvenience. 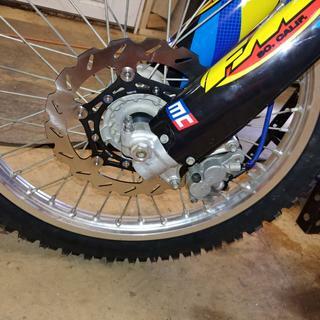 I need a replacement 270mm rotor, after having installed this kit on my 2006 CR250R. Can you order the rotor only? BEST ANSWER: we do not carry just a rotor i apologize about that. Does this come with brake pads or do you have to buy them separately? BEST ANSWER: This does not come with brake pads. Is it possible to purchase the extension bracket alone without the rotor? BEST ANSWER: We only sale the parts as a kit not individually besides the rotor sorry. I have a 2003 KLR650 with a two pot brembo front brake fitted. Will the caliper relocation bracket that comes with this product work for me? Hi how do you figure this rotor to fit a 2015 KLR if it only has 6 mount holes whereas the KLR has 9 mount holes? BEST ANSWER: This picture is generic and doesn't necessarily represent the actual product you will receive. If your machine is listed in the drop down menu, it will fit. BEST ANSWER: Correct, this kit includes the rotor and the billet aluminum caliper relocation bracket. How thick is this rotor for a KLR? I'm debating this or the 4mm thick EBC. BEST ANSWER: This is also 4mm thick. i read online about someone with EBC brake rotor upgrade, where the disclaimer says it is for race only, NOT FOR HIGHWAY USE. is this true for Tusk? is there such a disclaimer ? BEST ANSWER: We do not have a disclaimer stating that it cannot be used on he highway. We carry these for the KLR650 which can be a highway bike and there are no issues that arise from that application. Is there a replacement option that does not wear out as quickly for the ktm / husaberg lower shock heim bush?